A 3.3 volt, 2-chip solution. ANADIGM has introduced the SonicMaster1 in a move to offer an advanced subwoofer signal processing module solution for quickly upgrading existing subwoofer plate amplifier designs with an enhanced feature set that allows for state-of-the art subwoofers with minimal cost and negligible product development effort. Anadigm's audio dpASP (dynamically programmable Analogue Signal Processor) provides a programmable platform for subwoofer signal conditioning enabling equalisation, band-pass filtering and amplifier clipping and woofer bottoming limiter protection to an active subwoofer design. Such a platform also enables the addition of audiophile class- "all analogue" AutoEQ processing. SonicMaster1 is available as a chipset or module from Anadigm, and soon from a number of international OEM and ODM subwoofer plate amplifier vendors, as a separate daughter board or integrated plate amp. It comes out of the box with useable pre-sets: no engineering time or money is wasted on a steep learning curve. 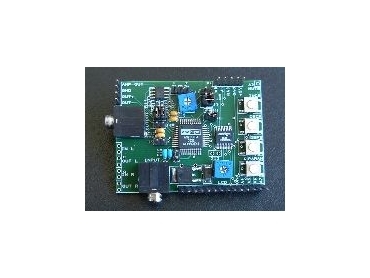 SonicMaster1 is a 3.3 volt, 2-chip solution using Anadigm's dynamically programmable Analogue Signal Processor (dpASP) with an Audio State Machine, enabling audio designers to develop signal processing functions that can be dynamically configured under the control of easy-to-use graphical software. Configurable functions include filters such as high-pass and low-pass (Linkwitz-Riley), notch, band-pass, and Linkwitz Transform. Long time constant averaging, peak detector and automatic gain control are all easy to implement. The first member of the SonicMaster series is the AN237K04, consisting of the AN231E04 dpASP and the AN237C04 state machine. The AN237K04 features 100% analogue signal path for Pure Analogue Sound, options for push button or rotary controls, LCD display module, factory presets and end-user adjustments. Additionally, SonicMaster1 provides programmable standby (AutoOff) power mode, Auto Mute feature that eliminates low-level noise between cuts and standby mode, and optional active differential input connections. Also, the new SonicMaster1 provides accuracy and control of the filter characteristics to a very high tolerance. Anadigm's SonicMaster solutions reduce the design cycle from weeks or months to a matter of days, while allowing a single circuit board implementation to be customised during manufacturing to serve multiple products with different feature sets, thus reducing the range of components that needs to be sourced by OEMs. A full-featured starter kit that includes evaluation board, embedded software, and PC GUI is available. Anadigm is represented in Australia by Nu Horizons Electronics .